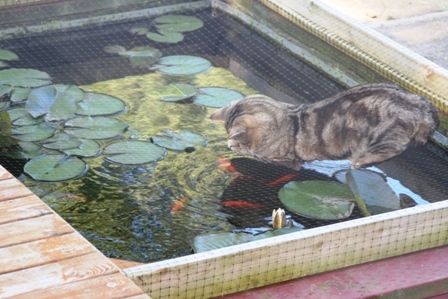 This is our outdoor kitty, Percy, sitting on the netting over Rick’s goldfish pond, wishing he could still go fishing. Before Rick put this netting on, I watched Percy sit on the ledge with his paw dipped in the water. The curious fish swam up to examine the paw, and – viola! – Percy snatched a tasty tidbit from the water. The goldfish are pets, too, receiving excellent upkeep of their habitat from Rick, so something was quickly done to hinder the little fisherman from decimating their numbers.